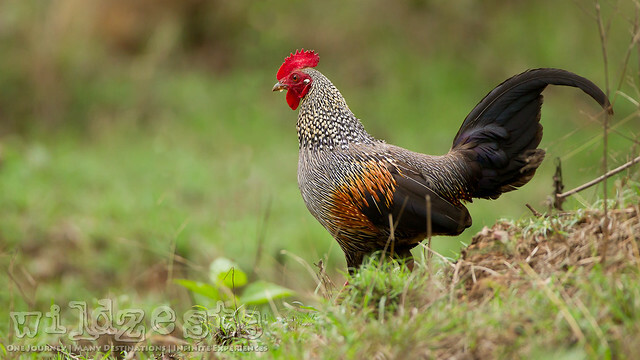 The Grey Jungle Fowls are a pretty common sight in the Nilgiri forests, however, getting them in good light and pose has always been a challenge. These wild chickens are pretty fast and will usually run into the bushes at the slightest sound or movement around them. Even when you do get them in the open, the angle of shooting is limited and getting a good background isn't always possible. During the recent Bandipur trip, we had a few bold moments by some very unsuspecting characters. Firstly, we had quite a few mongoose sightings where the usually shy creatures were infact displaying a totally daredevil behavior. The jungle fowls too were very forthcoming and in one instance, while we were waiting on something else, we had a pair of Grey Jungle Fowls having a quick meal at a termite mound. The diffused light due to the cloudy weather presented a good opportunity to capture details of this male's plumage.